Are Media Outlets Writing More about Insects as Food (Entomophagy)? As I follow the news on insects as food (entomophagy), I have been wondering if the pace of articles has been increasing because it seems that every time I turn around there is another article about cricket flour or a new book about eating bugs. To answer my question, I visited the U.C. Berkeley library to use the Lexis/Nexis news databases to run some searches*. For each search, I removed the non-U.S. articles that got through the U.S.-only filter, removed irrelevant articles (the w/5 insect search got a lot of hits about bats eating insects) and pulled out calendar listings (items like “Community calendar….Jane Doe reads from her new book ‘Eating Bugs’ at Midtown Books”). After all of the filtering, I was left with 60 articles for entomophagy, 45 for “(eat OR eating) w/5 bug”, and 32 for “(eat OR eating) w/5 insect.” The number of articles in each year are shown in the chart below. 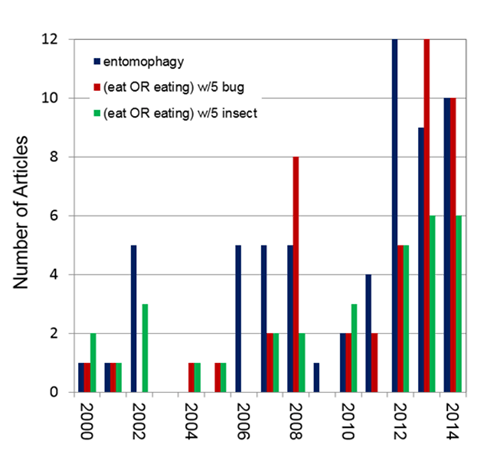 For entomophagy (blue bars), there was a bit of activity between 2006-2008, then a quiet period, with much more activity in the last three years. The other two searches (red and green bars) had little activity through 2011, but many more articles in 2012, 2013, and 2014. And so, it looks like my sense that there is more coverage of insects as food in the last few years is correct. As 2015 goes on, I hope to do a follow-up to see how insects as food has been trending in the media this year. A search on “cricket flour” might also be worthwhile, since this ingredient is gaining in popularity. * If you know of best practice guides for this kind of search — perhaps from a school of journalism or media studies — please let me know in the comments.